Polish retail brokerage company X-Trade Brokers (XTB) has seen a transition on its Management Board. Paweł Frańczak will be relinquishing his spot on the board after eight years to pursue other professional activities. Consequently, XTB’s Supervisory Board has installed Jakub Kubacki as its newest member with immediate effect. Frańczak has worked for the XTB for over a decade, dating back to 2008. He has been on its board of directors since 2012, serving as an integral component of its team and one of the broker’s co-creators. The past decade has seen him focus on a number of legal aspects that he directly supervised at XTB, having also managed its compliance, development, and operations. He has also supervised XTB’s Risk Control Department. In addition to XTB, Frańczak also sits on the Council of the Chamber of Brokerage Houses, as he concurrently has worked to foster a friendly regulatory environment in Poland. His departure from XTB does will not see him fully relinquish ties with the capital markets space. Rather, upon leaving the XTB, he will continue work as a lawyer and partner managing a corporate practice of a law firm together with attorney Piotr Stocki. In this capacity, Frańczak will work to develop a new department servicing legal, regulatory, and corporate clients, namely in fintech emergent technologies. 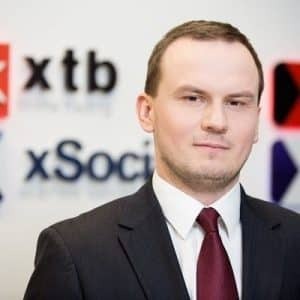 In parallel, XTB has appointed Jakub Kubacki as a Member of the XTB Management Board. He has been involved with XTB since 2010, having worked in its Legal and Compliance Departments. Since 2012 he has served as XTB’s Compliance Officer as well. His new mandate as a member of the Management Board in XTB will see him responsible for all legal components of the company. This includes compliance and supervision over the development and operation of the XTB capital group. Earlier this week, XTB also made headlines after reporting its Q1 earnings, which saw a strong filing to kick off 2018. The Q1 metrics improved on a yearly basis, with XTB securing noticeable across its operating revenues, up 94 percent year-over-year. The company attributed the solid revenues to higher trading volumes and the improved profitability per lot.